Print Media is important and the purpose of this blog is not to ask you to scrap traditional media. People do read newspapers, we do watch TV, but we are also spending a lot of time on Facebook. 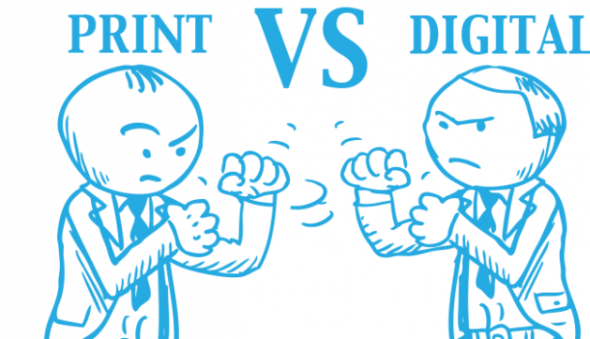 To see this as print Vs Digital is to miss the point, which is “don’t miss the power of two working together”, we’ve got examples from some of the biggest businesses in the world, successfully using both strategies hand-in-hand. But let’s be straight, Digital marketing is not just a “flavour of the month”. Billion plus users worldwide tells a story. So how can we make them work in combination and what does combining them look like? Traditional advertising is expensive and putting ad on newspaper hoardings and make budget disappear in no time. Further with so much of noise, was it heard? PPC marketing your budget is spent only when a customer actually shows interest by clicking it. Even if you’re running a half professional digital campaign, the money spent goes directly into building your brand. But you do not necessarily have to choose the medium that is cheaper. Campaigns on Facebook are designed to get interested customers onto your site or to send across their contact information whereas hoardings and radio jingles are all about increasing your brand profile. Facebook allows you to target a specific market that is mostly likely to buy with targets ads based not only on demographics but human behaviours and interests. This means you can target an audience that may be actively seeking out your products or services with the right message at the right time. Targeted campaigns in with traditional media is at best targeting publications or tv programs with a certain audience, it can’t match the digital methods. In Digital World your business can be viewed anywhere. The cost of doing that with traditional marketing is considerably more. It may look like I am trying to discourage on Conventional Advertising but if your prints ads are not aligned to Call to Action with online support, it would not get the potential ROI. Real Estate marketers world over are allocating higher budgets on digital marketing. While spending on print ads are reducing to the extend that in 2012 digital marketing spends consisted nearly 40% of the total ad spend by real estate companies. Mr. Sumant Goenka of Axiom Estates feels that India is catching up the trend as internet penetration in India has increased phenomenally over last five years. ROI from digital marketing far higher, it allows a very targeted marketing to Indian/ Bengali diaspora spread across the country and the world.